Extra capsular fractures which involve the femoral trochanters include intertrochanteric and subtrochanteric fractures. The intertrochanteric fracture is by far the most common and is classified according to the status of the lesser and greater trochanter. If neither of these is fractured, the fracture is termed a two part fracture. If either the lesser or greater is fractured, then the fracture consists of three parts. If both are fractured, the fracture is termed a four part fracture. These fractures generally result from a fall and typically occur in postmenopausal women. A AP radiograph of the left hip. This demonstrates an intertrochanteric fracture of the left femur. B Lateral radiograph of the left hip. 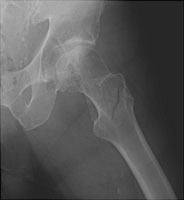 This shows the fracture line through the intertrochanteric region of the left femur. C Judet view of the right hip. Another example of an intertrochanteric fracture. This fracture is moderately displaced. D AP radiograph of the right hip. A third example of an intertrochanteric fracture. 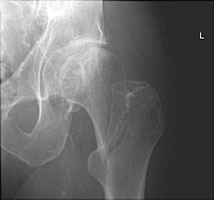 E AP radiograph of the right hip. The preceding fracture has undergone fixation with a dynamic hip screw and side plate.